Earthquakes, floods, tsunamis, volcanoes—they stem from the same forces that give our planet life. They have shaped our cities and their architecture; elevated leaders and toppled governments. 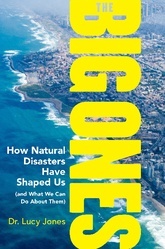 The history of natural disasters is a history of ourselves. Leading seismologist Dr. Lucy Jones offers a bracing look at some of the world’s greatest natural disasters, both ancient & modern, whose effects we continue to feel. With population in hazardous regions growing and temperatures around the world rising, the impacts of these disasters are greater than ever before. Natural hazards are inevitable; human catastrophes are not. With this energizing and exhaustively researched book, Dr. Jones offers a look at our past to prepare for our future.